Reliable handcuff access is a necessity when it comes to making effective arrests and detaining suspects. This is why Voodoo Tactical has produced their MOLLE Handcuff Case. 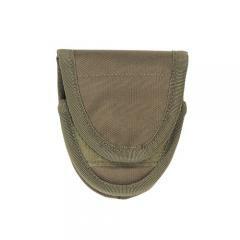 The minimalist pouch design fits virtually all linked and hinged cuffs for versatile applications. A low pocket style offers two-finger cuff access for rapid deployment, while a hook-n-loop secured cover flap provides superior handcuff retention without compromising tactical access. Dual MOLLE straps along the rear of the case offer secure attachment to vests, belts and packs for flexible attachment options in any situation. A durable, military-spec nylon construction with reinforced seams ensure lasting durability and maximum service life. Love it, wish they had this in a double pouch. Matched what my son has now and he is able to carry an extra set of cuffs on him.